Diva Foodies Twitter #FoodTVChat Week 3 is tomorrow night, March 26th at 7PM Eastern. 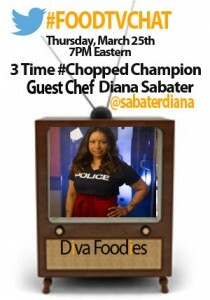 Please join us at #FOODTVChat and welcome our Guest Chef, three time #Chopped Champion Diana Sabater. Our favorite Twitter Food TV dude @donchefbunny will also be there to liven up the conversation. Diana Sabater is a single mother of two and former Philly police department officer. Chef Sabater’s passion for cooking led her to #Chopped where she won the Chopped Ultimate Championship Tournament, $50,000.00 and a new car! 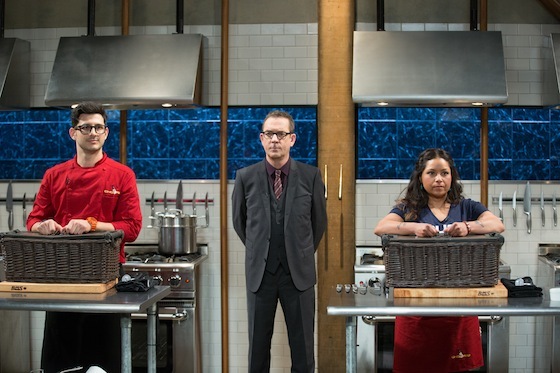 Trading in her “gun for a (kitchen) knife Chef Diana goes into the Cutthroat Kitchen! Following her impressive win on Chopped she took “the leap of faith”, left the police department and now is pursuing a career in food. I’m sure we will learn a lot more about her experiences on Food Network’s #Chopped, Cutthroat Kitchen and her current cooking dream tomorrow night on #FOODTVChat. Don’t miss this one–it is sure to be inspirational and interesting!